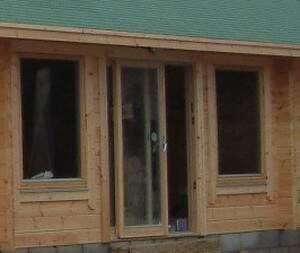 Which timber external doors are best for your log cabin? Selecting the right timber external doors is so important, find out why! Well think about it for a minute, not only are they the focus of your entry into your log cabin, but the main entrance door will see a lot of use over the years! So appearance needs to be good and the door must be robust enough to perform reliably over a long period of time. In terms of performance you want to get a door which has good security, opening mechanisms and also insulation and sealing properties. There are a lot of different timber external doors out there and there is a large range in how well they are made and perform, as well as how much they cost! Take a look at the most important aspects, to help you decide which ones to go for. What do You Look for in Timber External Doors? Your external door sizes may vary according to your individual needs and what standard sizes in your country are. In many countries there are minimum door sizes to meet building code or regulations, so if you are importing a log cabin make sure they comply with your local rules. 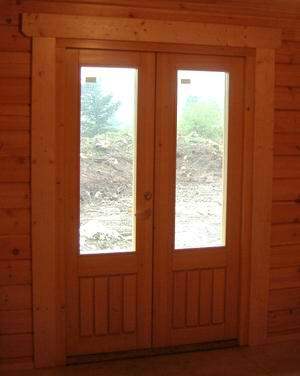 For some oversized timber external doors add a real feature to their log cabin! The other option is to have double doors in even multiple doors which concertina completely to one side! Being able to open a large amount of door area really allows you to enjoy the outside, when the weather is nice. In terms of style there is a lot to think about. For a start what type of look are your trying to achieve. Some people love modern, whilst for many traditional is the way to go. Then, should you have glass or not in your door? It does provide natural light which is great, but security may also be high on your list of priorities! Then think about whether you want an inward or outward opening door? 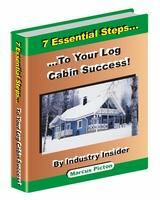 Many countries have there own preferences on this, but make sure what you order works for your own log cabin. The timber used and how it is constructed and styled is also very important. 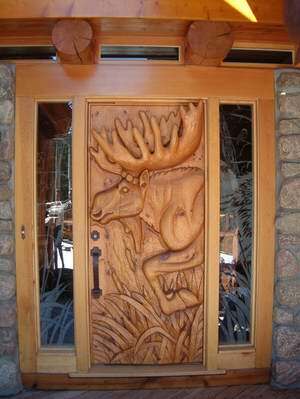 So people even get hand carved doors for their log cabin, which can create a wonderful feature in a log cabin! For a hinged door inward opening door tend to be the most popular globally for single external doors. This is because you don’t have to have room outside for it to open and you don’t need to step back to enter inside. It also allows for fly screens to be fitted to the outside, so you can operate the door from the inside, without opening the fly screen. The downside is you need the space on the inside to open the door properly and in very cold countries with lots of snow, if you open the door inwards snow may fall in. That is why you will often find outward opening external doors in Scandinavia, so the snow is swept away from the house when you open the door! So outward open doors really offer the opposite advantages and disadvantages to inward opening ones. Again the arguments for inward and outward opening doors are very similar to those described above for single doors. The other benefit with outward double doors is you can often fit a catch which allows the doors to be held open from the wall. The biggest difference with double doors is the fact that sliding or “patio” style doors can now be used, as well as hinged or “French” style doors. The benefit of sliding doors is that you can maximize the glass area more (due to structural reasons) and also the wind will not blow the door open or shut. The downside is that you can not open both doors (one slides behind the other), so you can not open the cabin up to the outside as much. You should try operating both types of doors and see which you like and what plus and minus points are more important to you. The type of door made up of 3 or more door, which slide and fold back one behind the other, are a relatively new idea, but are gaining in popularity in some countries. The beauty of them is it really opens up the inside of your house to outside areas. Often people create a large deck on the same level and it almost gives the feel of your room inside, continuing outside. If you love eating outdoors or enjoy the garden, this could be a great option! Whilst they also can look great, they are very expensive to buy and of course the structure must be to span the open gap which is needed to house the doors. In very wide opening you will need to have enough logs over the opening to provide a strong enough lintel. The overall efficiency of timber external doors is normally measured as a “U” or “R” value. This is determined by the level of heat loss from a unit. The glazing itself is the biggest contributor to this, but the frames and seals are important too! The thickness of the timber, whether it is solid wood and how well it keeps the weather out, can help reduce your running costs as well as be environmentally friendly! It depends on which country you are in, but most modern door units with glass, would be double glazed these days. The glass type used and what is contained within the sealed gap in the glazing, will significantly alter their effectiveness as well. We will go into the glazing in more details in our dedicated glazing section. We will not going into the security aspect of locks in this section (as it is covered in another section) but there are different types of locks out there. Conventional locks tend to be key operated and will normally have some type of keyless locking mechanism on the inside. Some doors will automatically lock again once shut, whilst other ones remain open as long as the key is not turned to the locked position again. Keypad locking systems are being more popular, and they do away with the need for keys. The type of handles used for your doors is normally selected to match or compliment that which is used in the windows too! They can vary from very modern designs, to very traditional wrought iron ones. Chrome and brass coloured finishes are popular with metal handles on more machined or engineered style log cabins. In North America where the more rustic style of log cabins are more popular, black wrought iron handles can often be found. Some people even get bespoke designs to match a theme they have created for their log cabin! Overall quality is very important for your external timber doors. The timber used and how it is put together to make the door, play an important role here. Seals, drip sills and other factors also need investigating. We reveal more on these aspects in our quality section for windows and doors. Fly screens are widely used in North America but are not found as much in some countries. Although I would say they are getting more common in Europe, they are by no means a standard feature. However if you live in a hot country in particular, or anywhere that suffers from flies, then fly screens make a lot of sense. Many have these built in as an option and they could enhance your enjoyment of your log cabin considerably in the summer months! Safety and security of your doors is very important! You want to sleep easy at night knowing your log cabin is secure and to go out without worrying about someone breaking in. There are several issues at stake here and we will go over them in more detail in our window and door safety and security section.